I don't know why but I never get tired of sushi. This is the reason why I immediately suggested that we dine at Omakase the moment an old college friend and her boyfriend invited Paul and I to meet up. The thought of the spicy tuna salad and the delicious sushi creations never fails to make me hungry. As always, the entire restaurant was packed with happy customers even on a weeknight. It's a good thing that there was an available table for four that can accommodate us. It was a breeze scanning their menu as I already knew what to get. Paul and I decided to share on one appetizer, a sushi platter and a savory item. We still wanted to make our dinner light so we skipped on the rice and noodle varieties. First off was my personal favorite -- the Spicy Tuna Salad. 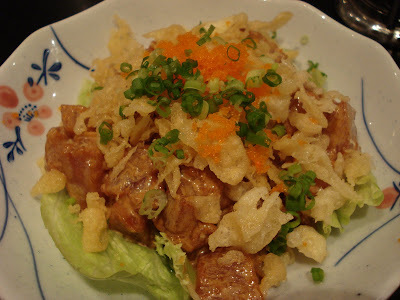 This has a generous serving of fresh tuna sashimi cubes mixed with their special spicy dressing and garnished with tempura flakes and chopped spring onions. I also love the addition of the crunchy orange ebiko on top of the salad. This is a perfect way to start your Omakase meal. The size is good for sharing with the group. Another favorite was the Dynamite Roll. Unfortunately, the scallop that's supposed to top the sushi was not available that evening but nonetheless, I enjoyed every single bite of this delicious sushi. Dip this into their soy sauce-mayo mix and you'll truly savor each crunchy bite. 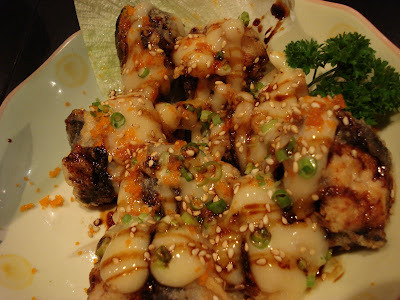 Last was our savory pick -- the Seafood Dumplings which is like a seafood meatball deep fried and topped with swirls of the soy sauce-mayo mix, sesame seeds, spring onions and ebiko! One bite will make you crave for more. This is also perfect with their fragrant Japanese sticky rice. There were a lot of catching up done as it has been two years since we last went out with them. It was a great evening as we laugh, ate and made plans to meet up more often from now on. 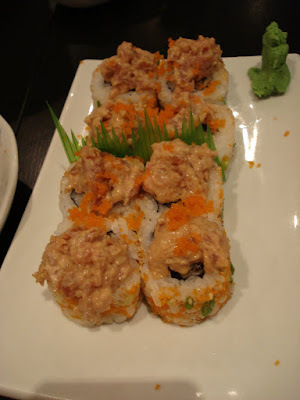 Omakase is located at the Ground Floor of Il Terrazo Mall, Tomas Morato in Quezon City. They also have a branch in Alabang and Libis. Contact them at 332-4115.
one of the things i miss about that philippines is that omakase was literally just in front of my house!!! !